FPV (or First Person View) is one of the newest, fastest growing hobbies in the world. Thanks to access to low-cost remote control devices such as airplanes, helicopters, cars, and boats, Hobbyists are able to get a first-person view as if they were sitting in the seat of their remote control device. Using a camera on the radio control device and connecting it to the Cinemizer as the viewfinder, one can get a real sensation of being the driver. The low power consumption of the OLED display and the integrated battery enable several hours of flying fun. The optional Eye Shield for the Cinemizer makes daytime flying very clear by blocking out ambient light from the daytime sun. FPV can also be used in many professional applications, e.g. hard-to-reach objects can be observed with a remote-controlled aircraft. An appropriately equipped helicopter enables a fire department to quickly gain an overview of the situation and make the correct decisions as quickly as possible. 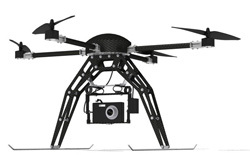 Want to know more about the FPV hobby? Try the following links where you can find out how to build your own radio controlled device as well as purchase a cinemizer OLED for the ultimate FPV experience! Interested in learning more? Check out the "unboxing" video and how the cinenizer works for FPV! Do you have hobby that the Cinemizer could be used to make it more interesting, fun and engaging?? Are you an FPV hobbyist and would like more information on how the Cinemizer can be connected to the camera on your remote control device.? Introducing the FPV Special Edition cinemizer OLED. This kit includes the cinemizer OLED, Eye Shield and one extra A/V video input cable?